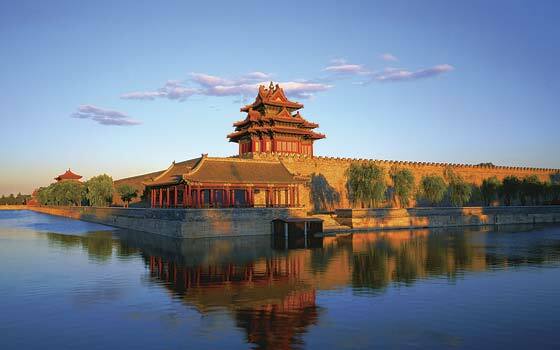 Description: Ancient empires, discovered treasures, forbidden cities, and unchanged landscapes await you in China. It is here you can walk the Great Wall built centuries ago, drift past rice paddies outside of Guilin, watch history be unearthed at Xian, recreate an emperor's life is Beijing, and wander wide boulevards or a maze of alleys in Shanghai. China is rapidly changing, but lucky for us, much will remain the same -- the richness of tradition, the variety of cuisine, and the kind and entle nature of the people. 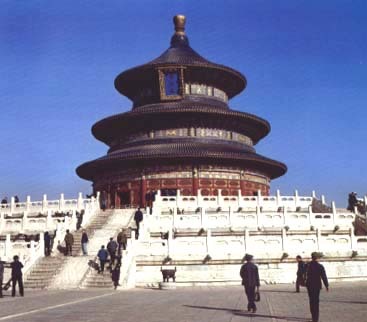 Beijing is known for its grandeur -- wide boulevards, China's finest museums, impressive temples, the infamous Tiananmen Square, and the grand Forbidden City -- made up of 800 buildings, it is the largest and best-preserved cluster of ancient buildings in China. Outside of the Forbidden City and throughout Beijing, hidden between the ever-emerging skyscrapers, you'll find the Hutongs, where the ancient way of Chinese life goes on as it has for centuries. The Hutongs are synonymous with a close knit neighborhood or small town, where families have lived in the same home for centuries, every one knows everyone, and the market is just around the corners. It's 12 million residents are a compelling mix of old and new. Early morning taiqi (tai chi) enthusiasts, bearded old men with caged songbirds, and amateur Peking Opera crooners still frequent the city's many parks. North of Beijing are some of the best preserved sections of the Great Wall -- a breathtaking sight as it snakes over the rugged and rolling hills. 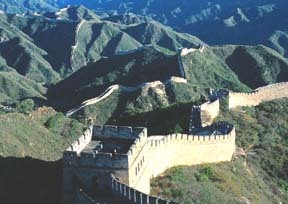 Built in stages 2,000 year's ago, the wall stretches for more than 3,000 miles. Ming Tombs consist of 13 tombs across 25 square miles of Chinese landscape. The Ding Ling tomb of Emperor Wanli has been excavated and can be visited. It contained 26 treasure trunks, a gold crown, fabulous headresses, and was sealed from the inside by two, four-ton, marble doors. Shanghai "City on the Sea". Shanghai has long been the commercial heart of China -- from the flamboyance of the 1920s and 1930s, to the productivity and prosperity of today. The city is an intriguing mix -- along the riverside are grand streets with European -- style buildings and a stone's throw away is the old Chinese Quarter and its maze of meandering alleys. Shanghai's shopping is said to be the most varied and rewarding in China. Climate: Beijing -- December - March, 14 to 39°F (-10 to 4°C); March and November, 28 to 52°F (-2 to 11°C); April, May, and September, 45 to 81°F (7 to 27°C); June -August, 64 to 88°F (18 to 31°C). Documents: U.S. and Canadian citizens, even infants, need a valid passport with a tourist visa stamped in it to enter China for stays of up to 90 days. It takes about 15 - 30 days to get a visa in the United States. Contact the Consulate General of the People's Republic of China (Visa Office; 520 12th Avenue, New York, NY 10036, tel. 212/330-7409). Cost approximately $50. Health Certificates: No vaccines are required to enter China, but travelers venturing into rural areas before or after Beijing may consider receiving vaccinations for hepatitis. Currency: Renminbi (RMB) or "People's Money". China is in the process of converting to hard currency, i.e., making the enminbi fully convertible with foreign money. Currently you cannot change RMB back into foreign currency in China, so change only as much money as you will need for the duration of your stay. Bank of China issues RMB bills in Yuan, the abbreviation in Y. Electricity: 220 volts, 50 cycles. There is no standard electrical outlet, although the outlet ofr three-prong plugs is the most common in hotels. Hotel usaually have prong adapters but no voltage transformers. Taxes and Tipping: The departure tax is Y90 airport tax (payable only in RMB) before check-in. Coupons are sold at booths inside the terminal and collected at the entrance to the main departure hall. After checking in, plan on long lines at immigration, especially in the morning. There is no sales tax. Hotels have a room tariff of 10% for service charge plus 5% tax. Restaurant, tip about 3% of the bill. Tip bellboys and room service waiter Y10 to Y20, or US$1 - $2. U.S. dollars are always appreciated as tips. It is not necessary to tip taxi drivers, although you might let them keep small change. Time: 8 hours adhead of Greenwich Mean Time (+8 GMT). Daylight Saving Time is not observed. 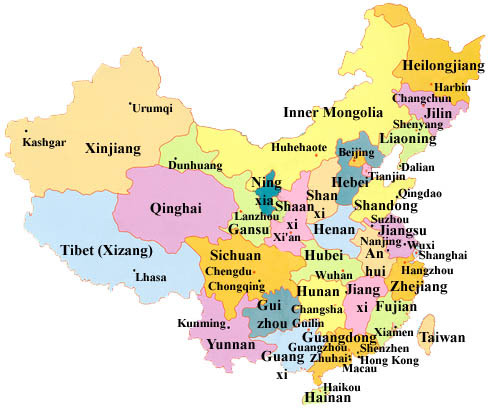 Languages: The national language of China is Mandarin, known in China as Putonghua. 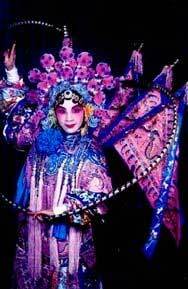 Nearly everyone speaks Mandarin, but many also speak a local dialect that uses the same characters as Mandarin but whose pronunciation can vary greatly. It is difficult for foreigners to speak Chinese, and even harder to be understood. Chinese appreciate your making the effort to speak a few phrases. Try "Hello" -- "Ni hao" (nee how); "Thank you" -- "Xie xie" (hsyeh, hsyeh); and "Good-bye" -- "Tsai jian" (chai chiyan). You can usually find someone who speaks English in the major cities. Transportation: Although cabs are the simplest way to get around the city, getting into a taxi in China requires some preparation. Because cab drivers do not speak English, make sure you get the address or exact location of your destination written down in Chinese and have handy a map in English and Chinese so that you can point to for your driver's reference. Departure Tax: There is an airport use tax, called a "construction tax", of 50 yuan for domestic flights and 90 yuan for international flights (including flights to Hong Kong). This tax is not included in the ticket price.